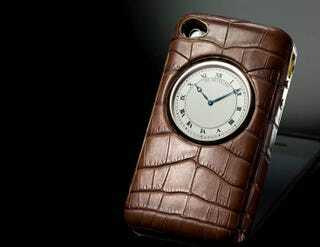 This is an iPhone case designed by fancy-pants watchmaker De Bethune. It's made of full-grain alligator leather and has a pocket watch with a DB 1024 movement built in. What the hell? We're not even going to bother trying to figure out why someone would place a pocket watch on a case intended for a device which has a clock feature, and will instead focus on the more ridiculous issue with this accessory: Its cost. The pricing—and the availability—of the case remain unannounced, but CrunchGear's resident watch expert John Biggs speculates that the price tag is bound to be in the thousands.